Fukuoka City Kyushu’s largest city and the capital of Fukuoka Prefecture, Fukuoka City consists of the Hakata and Fukuoka districts. Hakata has been a gateway to Asia and a merchant area for some 1000 years, while Fukuoka was home to samurai after a castle was constructed there in the 17th century. Both areas have a variety of shops, dining and entertainment spots. You will enjoy the coexistence of the old and new. There are Buddhist temples and Shinto shrines within walking distance of JR Hakata Station. 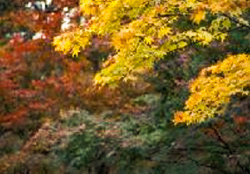 Dazaifu City Located about 20 km south of Fukuoka City lies the famous Dazaifu Tenmangu Shrine. In fact, from the late 7th to the late 12th century, “Dazaifu” was the national defense, administrative and diplomatic center of Kyushu. Near the site of the old Dazaifu Government Office, you will find Kanzeonji Temple, which was once the largest temple in Western Japan. 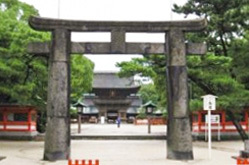 If you want to stroll around a quiet old temple in a lush green ancient city, visit Kanzeonji. There, you can also see Japan’s oldest temple bell and large Buddhist statues from the 9th to the 13th century. Kanzeonji Temple was built in the middle of the 8th century by Emperor Tenji in memory of his mother, Empress Saimei, who died in Kyushu. The original seven-structured temple was the head temple of Kyushu. However, it was mostly destroyed by consecutive fires in the 11th and 12th centuries. Only the bronze temple bell and just over a dozen Buddhist statues survived. The golden hall and the lecture hall were rebuilt in the 17th century. 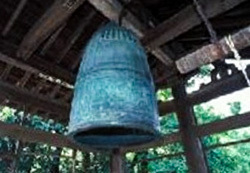 The bronze bell, cast around the end of the 7th century, was designated a national treasure for being the oldest temple bell in Japan.